Hawaiian quilts are characterized by simple yet bold motifs which are inspired by flora and animals native to the islands. 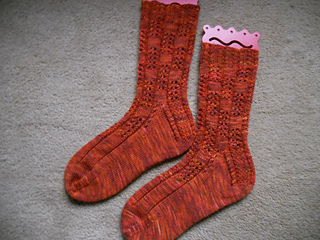 The lace in this sock reminds me of those quilts, something simple yet bold. 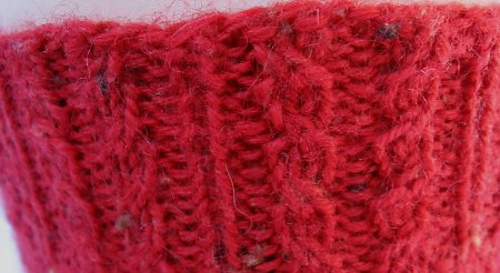 Sock is knit cuff down starting with a decorative ribbing. 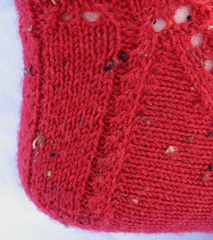 The heel flap/gusset features ribbing and an eop heel. The lace continues down the instep tapering down to the center and ends with a decorative wedge toe. 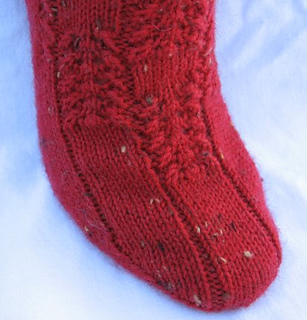 Sock may be knit smaller using a smaller needle and gauge. Pattern originally designed for TheKnitter.com SOTM Club, October, 2010. Sample sock is knit with Meilenweit Tweed (420m/100g) #137. Yarn in kit is a different color. Column 1 and row numbers missing from Chart C (large). Column 1 is all knits. Leg: Work Rounds 1-28 of Lace Pattern (Chart B) for a total of 2 repeats. Repeat rounds 1-12 once more. Note on instep (Chart C): Work Rounds 3-28 (do NOT work Rounds 1-2) of Chart C once. Work Rounds 1-48 (not 28) of Chart C one more time. Then repeat Round 48 only for pattern. 11/15/10: heel turn for large size should read: Row 1 (wrong side): slip 1, p20, p2tog, p1. Turn.